How can I use the VDF component 6005 and above in HTML (InternetExplorer) ? We will provide the CAB signed and you will have to set the LicVAL and also create the LPK file with LPK_tool.exe (like in version 5.x) and also set the server's license LICVAL license in your HTML page's properties. The LicVal can be purchased directly from us and for more information contact our sales department. lpk_tool.exe can be found on MSDN and Microsoft's WebSite. 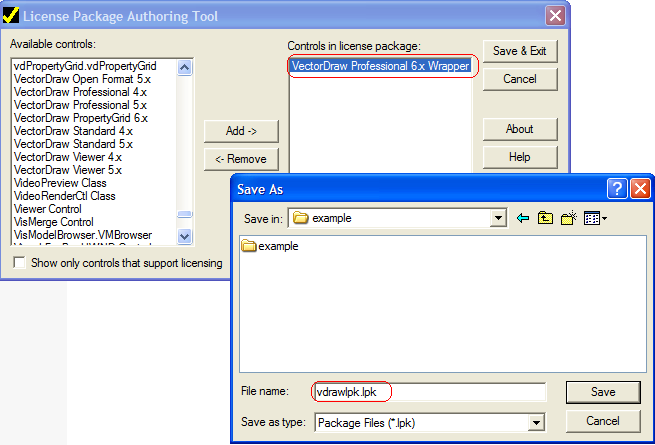 Run the lpk_tool.exe application, choose in the left column the "VectorDraw Professional 6.x Wrapper", Press Add , (in the right column should be only that, and then press "Save & exit" and give the name (in the temporary directory) "vdrawlpk.lpk". This should produce the vdrawlpk.lpk file. !!!! !The vdrawlpk.lpk file must be in the same folder in your server as the html files. Note also that in some webservers the filenames are case sensitive so the filename of the LPK file in your web-server and the VALUE of the LPK object in your HTML code must be the same.